Welcome to the Thriving Empath Community! Cheers for saying yes to this magical journey. Your whole life opens up by saying yes. Tired of feeling different from other people and just want to be like everyone else? Well, empaths experience life in a deeper way and that way is different from everyone else. Living life the way everyone else does is really hard and leads to isolation, feeling off-balance, and uncomfortable. So what do you have to lose? 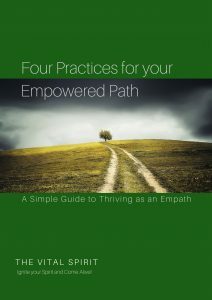 Click the image to the right to download your free copy of Four Practices for your Empowered Path. I hope you enjoy the journey. I also ask that you reach out if you have questions. The Vital Spirit also manages and facilitates a closed Facebook group called The Thriving Empath Community Join us if you are looking for like-minded individuals.